Is the man called Jesus really the son of God (the one sent from God) and can He give people eternal life? The birth of Jesus, the miracles He did, his life, his resurrection from the dead and his words show that He really is the Son of God (sent from God). While you listen to this, look at the pictures in the pink book. When you hear this music (MUSIC), turn to the next picture. Look at the picture. It shows a newborn baby and a woman, the baby's mother and her husband. The three other men are shepherds. They are all looking at the baby. His name is Jesus. One man kneels before Jesus. Why would he do that? The reason is that Jesus was the most important baby boy ever born. Before Jesus was born, He was already with God in a place called heaven. All things were created by God. God is Spirit, but He has shown himself in Jesus, who was born while his mother was still a virgin. The Spirit of God made this possible. The same Spirit lived in Jesus Christ. All this means that this Jesus is God. Jesus came from heaven to set us free from sin and to show us how we can become children of God. When Jesus had grown up, He once went to a wedding feast. His disciples (close followers) and his mother, Mary, went with Him. Mary knew that Jesus was the Son of God, so when the wine ran out, she told Him about it. Then she said to the servants, "Do whatever he tells you." There were six large water jars nearby. 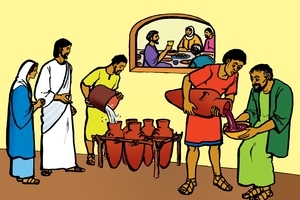 Jesus said to the servant, "Fill the jars with water." They did. Then He said, "Now draw some out and take it to the master of the banquet (feast)." The water had turned into the very best wine! The disciples of Jesus began to see that He had great power from God and they believed in Him. One night a man named Nicodemus came to speak to Jesus about the miracles He had done and about God. 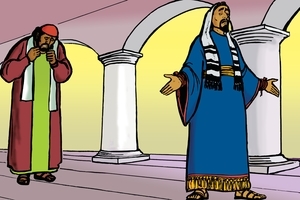 Nicodemus was an important ruler and teacher in Israel. He had heard that Jesus could work miracles. He knew that Jesus must be from God. Jesus said to him, "I tell you the truth, no one can see the kingdom of God unless he is born again." Nicodemus asked, "How can a man be born when he is old?" Jesus answered him, "When a baby is born from its mother, it has physical life. In the same way a man must be born from the Spirit of God to have spiritual life." Jesus meant that it is not enough to be born in the usual way. A person also needs to be born again through the work of God's Holy Spirit. The Holy Spirit shows people their sin and helps them to turn away from their old way of life and from Satan's lies. They will start to live (according to God's will) (or to please God). Then they will know that Jesus saves all who believe in Him. So, everyone who really believes and obeys the Lord Jesus, is born again. Believers live forever, because the Spirit of God lives in them. But everyone who does not believe in Jesus, will be removed from God's presence forever and he or she will never be able to enter heaven. The man in this picture travelled a long way to find Jesus. He was a very important ruler. His son was close to death, so he begged Jesus saying, "Sir, come down before my child dies." Jesus replied, "You may go. Your son will live." The man took Jesus at his Word (believed Jesus) and went home. 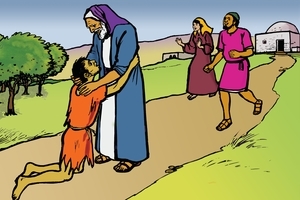 While he was still on his way, his servants met him with the news that his son was alive. The fever had left the child at the very moment when Jesus had said, "Your son will live." So, that man and his whole household believed in Jesus. In the city of Jerusalem there was a pool. 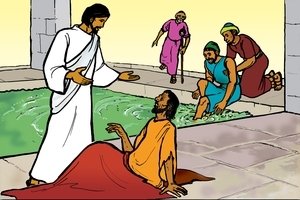 The people believed that at certain times, the first person to enter the pool after the water was stirred, would be healed. One man had been sick for thirty-eight years. Jesus saw him beside the pool and said, "Do you want to get well?" The man replied, "I have no one to help me into the pool when the water is stirred." Then Jesus said, "Get up! Pick up your mat and walk." At once the man was healed. Some people were angry with Jesus because He healed the sick man on the Sabbath, God's special and holy day. This was the day when the Jews rested from their daily tasks, to worship God. The man went away and told the Jews that it was Jesus who had made him well, but they did not want to believe in Jesus. This act of healing showed that Jesus had the right and the power of God to heal on any day, also on the Sabbath day. Many people had heard that Jesus could heal the sick and one day a great crowd followed Him to a remote (lonely) place. 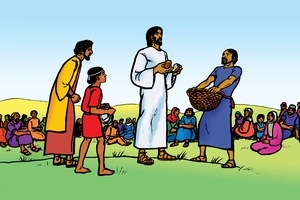 Later that day Jesus asked his disciples, "Where shall we buy bread for these people to eat?" One disciple replied, "Here is a boy with five small barley loaves and two small fish, but how far will they go among so many?" Jesus made the people sit down. 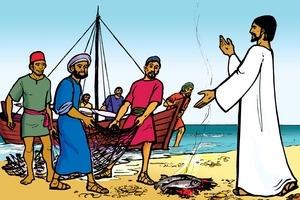 He took the loaves and the fish and gave thanks to God. Then He broke the bread and fish into pieces and gave them to the people, as much as they wanted. The next day the crowd still followed Jesus. Then He said to them, "I tell you the truth, you are looking for me, not because you saw miraculous signs but because you ate the loaves and had your fill. Do not work for food that spoils, but for food that endures to eternal life, which the Son of Man will give you." Jesus was speaking about himself. He also said, "I am the bread of life. He who comes to me will never go hungry, and he who believes in me will never be thirsty." 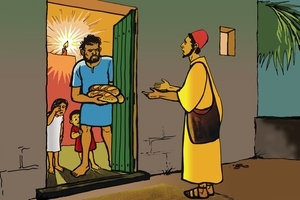 Soon after Jesus had fed the people, He sent them away. He then went to a mountain by himself, to pray to God. The disciples got into a boat to cross a great lake. It was dark and a terrible storm arose on the lake. 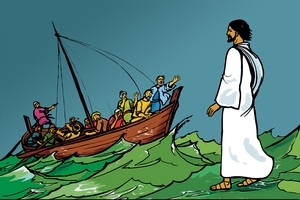 Then Jesus came to them, walking on the water. They thought that it was a ghost and they were terrified (very scared). Jesus said to them, "It is I; don't be afraid." He got into the boat with them and immediately the storm ceased. This again showed the disciples and also shows us that the power of God worked through Jesus. There was a man who had been blind from birth. 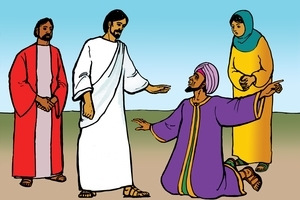 Jesus' disciples thought that he was born blind because he or his parents had sinned. 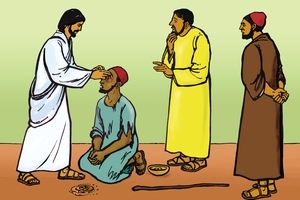 But Jesus told them that this man had been born blind so that they could see God's work demonstrated (shown) in his life. He spat on the ground and made mud (with saliva). He put the mud on the blind man's eyes. Then Jesus said to him, "Go, . . . wash in the Pool of Siloam." Siloam means "sent". The man obeyed Jesus. He went, washed and came home seeing. Many of us are blind in our understanding of God's ways. But Jesus said, "I am the light of the world. Whoever follows me will never walk in darkness, but will have the light of life." It is also written, " . . . if we walk in the light, as he is in the light, we have fellowship with one another, and the blood of Jesus, his Son, purifies us from all sin." There was a man named Lazarus who was very sick. His two sisters, Mary and Martha, sent a message to Jesus saying, "Lord, the one you love is sick." When Jesus heard the message He said, "This sickness will not end in death. No, it is for God's glory so that God's Son may be glorified through it." Jesus loved Lazarus and his two sisters. But Jesus did not go to him at once. Only two days later He said to his disciples, "Lazarus is dead, and for your sake I am glad I was not there, so that you may believe. But let us go to him." When Jesus came, Lazarus had been in the tomb for four days. The sisters were grieved because Jesus had not come to heal him, but Jesus said Martha, "Your brother will rise again." He also said, "I am the resurrection and the life. He who believes in me will live, even though he dies; and whoever lives and believes in me will never die. Do you believe this?" Then He told the people present to open the tomb. 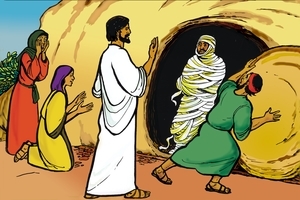 He called, "Lazarus, come out!" 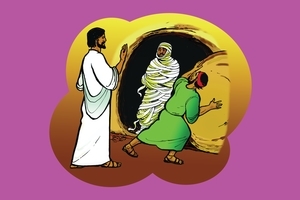 And Lazarus came out, still wrapped up in the grave-clothes. Jesus proved by the miracles He did, that He is the Son of God. The Jewish leaders were jealous of Him and wanted to kill Him. Jesus told his disciples that He must die for the sins of all people. That was the only way in which He could bring men, women and children back to God. Judas, one of Jesus' disciples, betrayed Him to the Jews for a sum of money (30 pieces of silver). They came and arrested Jesus. Peter and the disciples fled in fear. The Jewish leaders then took Jesus to court, but could not prove that He had done anything wrong. But they cried out, "Crucify! Crucify!" Later Jesus was brought before the people. They also cried, "Take him away! Take him away! Crucify him!" So the perfect son of God was killed. Two criminals died with Him. They were punished for their crimes, but Jesus who had never done anything wrong, died as a sacrifice for the sins of all people, including yours and mine. Jesus was the only sacrifice God would accept for our sins. One of Jesus' followers named Joseph asked for Jesus' body. 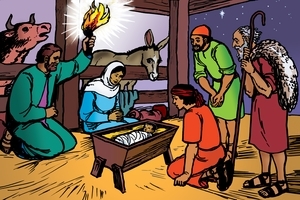 It was given to him and Joseph laid the dead body in a new tomb Joseph had made for himself. Joseph rolled a great stone against the entrance. 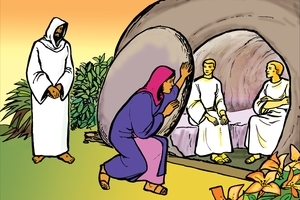 On the third day Mary Magdalene went to the tomb. The stone had been rolled away. Mary began to cry. She bent down and looked into the tomb. The body was gone. Two angels sat where the body of Jesus had been. When Mary turned around, she saw a man standing there, but she did not realise that it was Jesus. Jesus asked Mary, "Woman, . . . why are you crying? Who is it you are looking for?" Mary thought He was the gardener, and she asked Him where the body of Jesus was. Then Jesus said to her, "Mary." She realised it was Jesus. He was alive! He said to her, "Go . . . to my brothers and tell them, 'I am returning to my Father and your Father, to my God and your God.'" By 'brothers' Jesus meant his disciples. Before Jesus returned to heaven, He did another miracle. One night some of his disciples went fishing, but they caught nothing. Just as morning came, a man appeared on the shore of the lake. He told them to throw their nets out on the right-hand side of the boat and they would find some fish. They obeyed and caught a large number of fish. 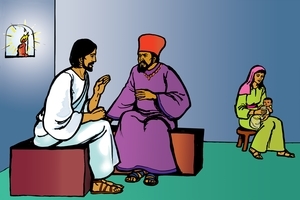 Then the disciples realised that the man who talked to them was Jesus. They brought all the fish to the shore. There Jesus had already prepared some food for them. After they had eaten, He spoke to them. Peter was also amongst them. Peter had run before, with the other disciples, when Jesus was arrested and later he denied Jesus. Jesus said to Peter, "Follow me!" He told Peter to teach God's people, to take care of them and to teach them to share the good news of Jesus and of how He came to die for the sins of all people and overcame Satan when He rose from the dead. God wants all people to hear about Jesus and his miracles so that they can believe that He is God's Son. Follow Him and you will also be saved and receive everlasting life. Jesus is the great Saviour. He saves us from sin and evil, and He gives us everlasting life. Listen to more teachings about Jesus. Look at the next picture when you hear the music. Many Jews hoped that Jesus would save them from their hated Roman rulers. But that is not why Jesus came to the earth. So later on these Jews asked the Roman rulers to kill Jesus. 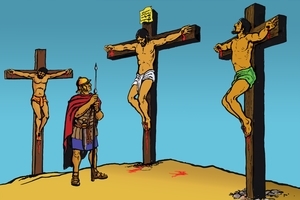 Do you remember how the Roman soldiers killed Jesus by nailing Him to a cross where He died? 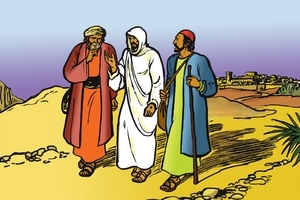 After He had risen from the dead, two of his disciples were walking home. Suddenly Jesus appeared to them. They thought He was a stranger, so they told Him what had happened those past few days. Then Jesus explained to them what Moses and all the prophets of God had said about Him (Jesus) in the Scriptures many years before. The prophets had said that He would suffer and die. They had also said that He would rise from the dead to sit at his Father's right hand from where He would rule in God's kingdom forever. That evening Jesus sat down to eat with these two disciples. As He broke the bread and gave it to them, their eyes were opened and they recognised Him (saw that it was Jesus). Then He disappeared from their sight. They went to Jerusalem to tell the other disciples that they had seen Jesus and that He was alive. Let us hear what Jesus himself teaches us from the Scriptures. Before Jesus' death, He once told a parable about a man who had two sons. The younger son said to his father, "Give me my share of the family property." So the father divided his property between the sons. The younger went away to a far country. He wasted his money in wild living. Then a great famine came to that land. The young man had nothing left. So he went to work for a man who sent him to his feed pigs. 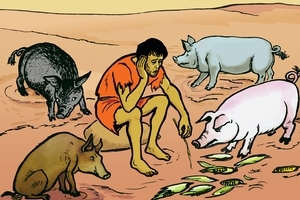 He was so hungry that he wanted to eat the pigs' food. Then he came to his senses and said, "How many of my father's hired men have food to spare, and here I am starving to death! I will set out and go back to my father and say to him: Father, I have sinned against heaven (God) and against you. I am no longer worthy to be called your son; make me like one of your hired men." So he got up and went to his father. While the son was still a long way off, his father saw him. The father ran to his son, embraced (threw his arms around) and kissed him. 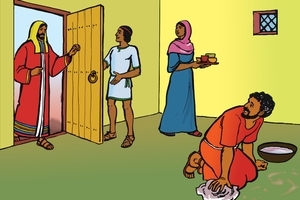 He told his servants to bring the best clothes and to prepare the best food. And he also said, "Let's have a feast and celebrate. For this son of mine was dead and is alive again, he was lost and is found." There was great joy. Jesus told us that God is like that father. All people are like the son who had sinned. But God still loves us. He longs for us to come back to Him. He wants to forgive us. So He sent Jesus to seek and to save those who are separated from God. People whose lives are separated from God, are lost and Jesus is the only way for lost people to come back to God, the Father. 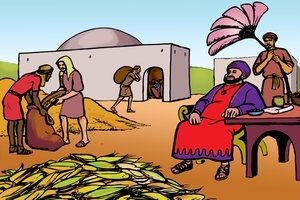 Jesus told the crowd another parable (story) about a rich man who had very good crops. He planned to build big barns to store it all and to say to himself: "You have all you need, for many years. Take life easy, eat, drink and enjoy yourself." But God said, "You fool! This very night you will die. Then who will get all these things you have gathered together?" Jesus said, "This is how it will be with anyone who stores up things for himself but is not rich towards God (in his relationship with God and his trust in Him)." Jesus also told a parable about another rich man who had everything he wanted. 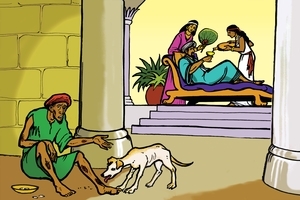 But he did not care about the beggar at his gate. The poor beggar died and went to heaven. There he sat at the side of Abraham, from whom all the Jews descended. When the rich man died, he went to hell, the terrible place of fire and suffering. From there he looked up and saw Abraham and the beggar far away. He called to Abraham to send the beggar to give him some water, but Abraham said, "Between us and you there is a big gap, so that those who want to go from here to you, cannot, nor can anyone cross over from there to us." In hell there is no comfort and no way of escape. Those who go there will suffer forever. Whether we are rich or poor, we should love and obey God. Believe in the Lord Jesus Christ and you will be saved from going to hell, and receive everlasting life from God. Once a man went to his friend and said, "Friend, lend me three loaves of bread, because a friend of mine on a journey has come to me, and I have nothing to set before him (I have no food for him)." The friend and his family were already in bed. He did not want to get up. But the man at the door was not ashamed to keep on asking, so the friend got up and gave him what he wanted. Jesus said, "Ask and it will be given to you; seek and you will find; knock and the door will be opened to you. For everyone who asks receives; he who seeks finds; and to him who knocks, the door will be opened." God wants to be our good Father. He wants to give his Holy Spirit and wants to supply all our needs. All we have to do is to keep asking Him in prayer that He helps us to obey his Word and to trust Him. In the picture we see two men praying in God's temple. One man was very religious. He was also very proud. He only prayed about himself and said, "God, I thank you that I am not like other men - robbers, evildoers, adulterers - or even like this tax collector. I fast twice a week and give a tenth of all I get." God was not pleased with this man and his prayer. The other man was a dishonest tax collector. He had stolen people's money. He knew he had not pleased God. He beat his breast and bowed his head in shame. He prayed to God and said, "God, have mercy on me, a sinner." Jesus said that God heard his prayer. He forgave his sin. God rejects those who are proud, but welcomes those who are sincere and humble in heart, and He answers their prayers. One day Jesus taught many people and He said, "A farmer went out to sow his seed. 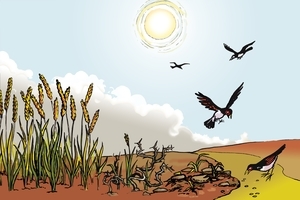 As he was scattering the seed, some fell along the path; it was trampled on, and the birds of the air ate it up. Some fell on rock, and when it came up, the plants withered because they had no moisture. Other seed fell among thorns, which grew up with it and choked the plants. Still other seed fell on good soil. 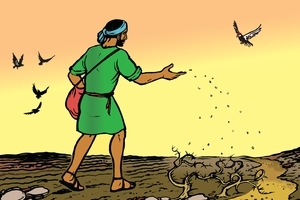 It came up and yielded (gave) a crop (harvest), a hundred times more than was sown." Jesus said to the people, "He who has ears to hear, let him hear." Jesus explained the parable in this way, "The seed is the word of God. Those along the path are the ones (people) who hear, and then the devil comes and takes away the word from their hearts, so that they may not believe and be saved. Those on the rock are the ones who receive the word with joy when they hear it, but they have no root. They believe for a while, but in the time of testing they fall away. The seed that fell among the thorns stands for those who hear, but as they go on their way they are choked by life's worries, riches and pleasures, and they do not mature. But the seed on good soil stands for those with a noble and good heart, who hear the word, retain it (apply it in their life), and by persevering produce a crop (harvest)." How will you hear and receive the Word of God? Will you disobey and be lost? Or will you believe God's Word and obey it to please God? Then you will be like the seed in good soil. How can we be sure that we are pleasing God in our everyday living? God's Word, the Bible, teaches us that we must love God and also love people. But who are the people we should love? Jesus told a parable about a man who travelled down a lonely road. Some robbers attacked him. They stole all he had and left him almost dead. Later two very religious men came along. They saw the injured man, but they not did want to help him. Then a foreigner came down that road. He felt very sorry for the injured man. 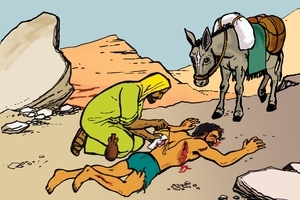 He bandaged the man's wounds, put him on his donkey and took him to a place to overnight there and get further help. Jesus said that if we love God, we should also show this love by helping anyone who is in need. Do you remember that after Jesus died, He rose from the dead? His disciples saw Him before He returned to heaven. Jesus told them that He would come back again. He said that all those who believe in Him, should be like servants who are waiting for their master to return from his wedding feast. Jesus said, "It will be good for those servants whose master finds them ready . . ."
We do not know when Jesus will come back. We should work for Him and be ready to receive and welcome Him as soon as He arrives. Then it will be a time of great joy and happiness. For unbelievers (those who do not believe in Jesus) it will be a time of great sorrow. Jesus also said that those in charge of his servants must be ready for his return. If they run his household well and care for his servants they will receive a great reward. But if they mistreat (beat) the servants, and misbehave (get drunk), their punishment will be severe. Jesus can save anyone from sin. Listen to this: Zacchaeus was a rich tax collector. He was dishonest and he stole money from people. He heard that Jesus was coming his way and he wanted to see Jesus, but he was very short and Jesus was surrounded by a great crowd. So Zacchaeus climbed up a tree. 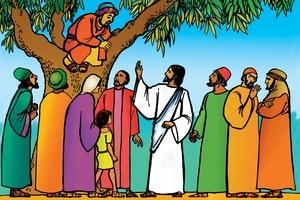 As Jesus passed by, He looked up and said, "Zacchaeus come down immediately. I must stay at your house today." The people were surprised. Zacchaeus was not a good man. But Zacchaeus came down and welcomed Jesus gladly. He told Jesus that he would turn from evil and change his ways. He would give back all he had stolen. Jesus said, "Today salvation has come to this house . . . "
Jesus came to seek and to save anyone who is lost from God. Like Zacchaeus, you must set your life right with God by believing in and obeying Jesus Christ. He will give you strength to turn from the wrong things in your life. See different versions of this script in Afrikaans, Buhutu, Chinese Simplified, English, French, Herero, Indonesian, Kimwani: Ibo, Lomwe: Mozambique, Malagasy Merina, Ngonde, Northern Sotho, Obo Manobo, Pijin: Solomon Islands, Portuguese: Brazil, Portuguese: Mozambique, Russian, Sena: Mozambique, Shimaore, Shona, Spanish, Swahili: Tanzania, Takwane, Tok Pisin: PNG, Tonga: Malawi, Tsonga, Umbundu, Urdu, Venda, Xhosa, Xirima, Yao: Malawi, Zulu.